Cartooning | The Art Of | Kids VT - small people, big ideas! Ava Kathleen Albrecht is just 8 years old, but she's already juggling multiple publishing projects. More specifically, three original comics: The Samurai's Plans, The Lady and the Magic Creatures and Minecraft Magic. Ava was one of 12 kids drawing furiously on a Saturday morning in May at the Center for Cartoon Studies in White River Junction. On weekdays, adult students work in the school's refurbished post office studio. But the Saturday Morning Cartoon Club is for kids ages 9 and up. 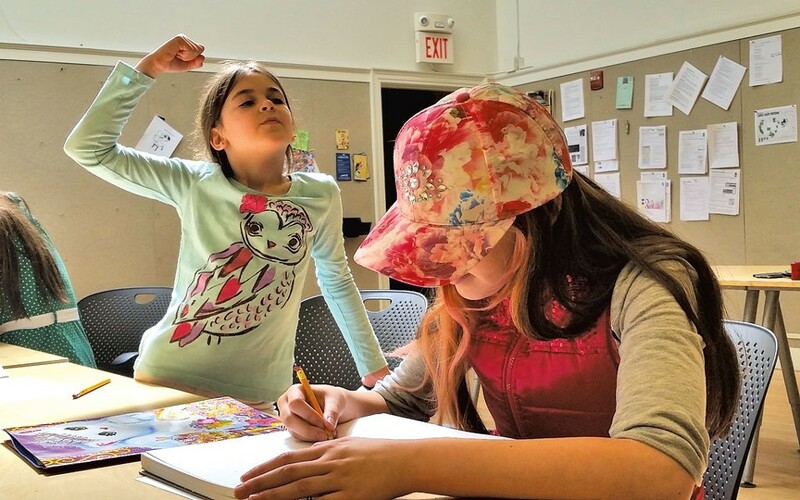 Across the sun-dappled classroom from Ava, 10-year-old Olivia Ferraro worked on a one-page comic chronicling the evil deeds of her seemingly innocent cat, Lucy. Avery Swett, also 10, labored over the surprisingly heroic story of The Unuseful Magician. And Bradlee Smith dispensed career advice in the Guide to Being a Ninja. One tip: Obtain nunchuks as soon as possible. Four fashionably dressed students from CCS's cartooning MFA program were running the show, the goal of which is to nurture a love of comic storytelling and sneak in some real drawing instruction. Lessons differ every month, but the structure of the class is always the same. Lead teachers Rebecca Roher and Stephanie Zuppo launch it with some quick aerobic stretches to get everyone's blood pumping, followed by an introductory drawing activity. Students then focus on one particular skill or theme, such as gestures or expressions. Roher wants kids to look at published comics with a critical eye and incorporate what they notice into their own work. This particular class fell on Free Comic Book Day — May 2 — when stores across the country give away comics produced and distributed by the major comic book publishers. Building on that idea, Roher and Zuppo told students that they'd each create an original comic book, which they could photocopy and share with their peers. The kids began to draw immediately, without a hint of shyness. Turns out girls like ninjas and zombies as much as boys do. Defying the stereotype that comics are more popular with males, the genders were pretty equally represented in the class, and three of the four teachers were women. Isabella Hall, 13, fills her stories with strong female characters. "I sometimes relate to [being] curious and adventurous," she remarked while drawing swords. "But I don't really want to adventure when I grow up. I just want to draw comics all day." "You can't stop these kids from drawing," said CCS president Michelle Ollie, as she looked around the classroom of concentrating kids. "And to get them in a room like this where they're around their peers and friends ... 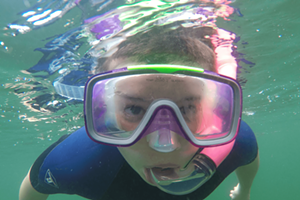 It cultivates their interest and ... provides a deeper experience." She hopes to create more programming that will help young Vermonters pursue cartooning and other careers. Dave Lloyd, CCS's operations manager, believes that these kids are learning things that will prove useful down the line. "Cartoonists convey difficult messages in very simple imagery," he explains, and that's a desirable skill in an increasingly complex digital world. The students in the cartoon club seemed to know they're gaining valuable experience. Ninja aficionado Bradlee said that he's learned how to smudge ink to create a sense of motion when he draws comets and asteroids. Isabella explained that she's gotten much better at making drawings that propel the story forward. The kids also seemed to be aware of some of the more intangible benefits. "I've learned that drawing makes your imagination grow," Ava reflected. Then she turned back to her samurais, hoping that, this time, she'd get the shoulders just right. 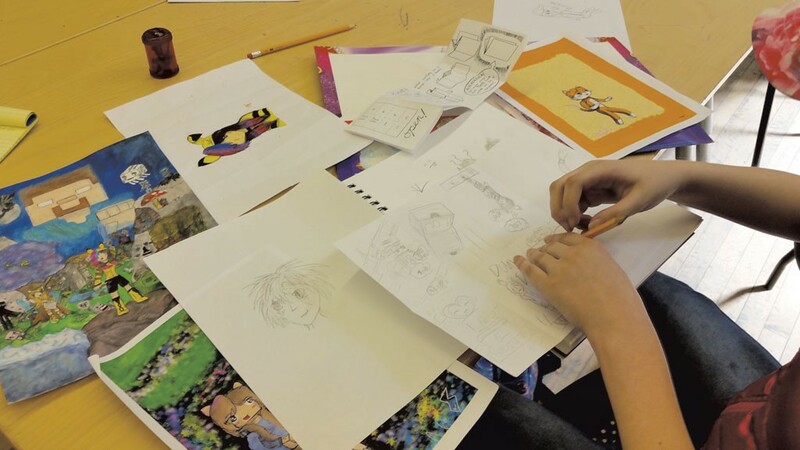 Find information about an upcoming summer Cartoon Club for kids ages 9 and up — and a weeklong "Create Comics" boot camp for teens — at cartoonstudies.org/index.php/programs/summer-workshops.